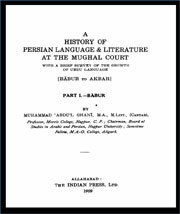 Some valuable works exist on the growth of Persian language and literature in Persia, but there was none available hitherto in a concise and connected form of any period in India. The present work, therefore, is an attempt to supply a long-felt need in that direction. 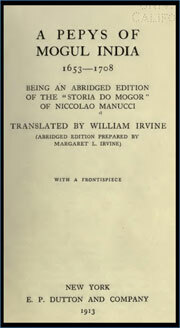 A Mohammedan, a Mongol, a descendant of the monster Timur, the son of a weak incapable father, born in exile, called when but a lad to the government of a disintegrated and almost annihilated realm in the India of the sixteenth century,—which means in an age of perfidy, treachery, avarice, and self-seeking,— Akbar appears before us as a noble man, susceptible to all grand and beautiful impressions, conscientious, unprejudiced, and energetic, who knew how to bring peace and order out of the confusion of the times, who throughout his reign desired the furtherance of his subjects’ and not of his own interest, who while increasing the privileges of the Mohammedans, not only also declared equality of rights for the Hindus but even actualized that equality, who in every conceivable way. The hero of our narrative, ran away from Venice in 1653, being then fourteen. He hid on board a vessel bound for Smyrna, and was fortunate enough to find a protector in a certain Viscount Bellomont, an English nobleman, then on his way to Persia and India. He followed Bellomont through Asia Minor to Persia, and from Persia to India, meeting with many adventures by sea and land. The sudden death of his master near Hodal, in 1656, left Manucci friendless in a strange land. 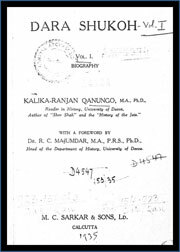 This is the book of his very interesting adventures in India of that time where he was employed by various important figures of history of that time. The Akbarnama which translates to Book of Akbar, is the official chronicle of the reign of Akbar, the third Mughal Emperor (r. 1556–1605), commissioned by Akbar himself by his court historian and biographer, Abul Fazl who was one of the nine jewels in Akbar’s court. It was written in Persian, the literary language of the Mughals, and includes vivid and detailed descriptions of his life and times. Describes the life of Aurangzeb with a lot of detail. Jadunath Sarkar (10 December 1870–19 May 1958) was a prominent Indian Bengali aristocrat and historian. Jadunath Sarkar (10 December 1870–19 May 1958) was a prominent Indian Bengali aristocrat and historian. 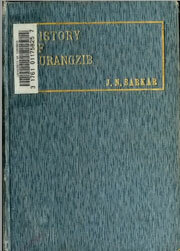 This is the volume 1 of the five-volume History of Aurangzib by Sir Jadunath Sarkar. 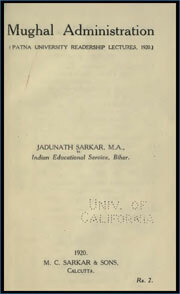 Jadunath Sarkar (10 December 1870–19 May 1958) was a prominent Indian Bengali aristocrat and historian. 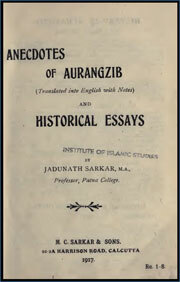 This is the volume 2 of the five-volume History of Aurangzib by Sir Jadunath Sarkar. Francklin was the eldest son of Thomas Francklin, by his wife Miss Venables. He was admitted on the foundation at Westminster in 1777, whence he was elected to Trinity College, Cambridge, in 1781. Preferring to engage in the profession of arms, he was admitted a cadet in the service of the East India Company in 1782and spent rest of his life in army in India. This book is a first hand account of Ali Gauhar (25 June 1728 – 19 November 1806), historically known as Shah Alam II, the fifteenth Mughal Emperor, was the son of Alamgir II. Shah Alam II became the emperor of a crumbling Mughal empire, his power was so depleted during his reign that it led to a saying in Persian, Sultanat-e-Shah Alam, Az Dilli ta Palam, meaning, ‘The kingdom of Shah Alam is from Delhi to Palam’, Palam being a suburb of Delhi. 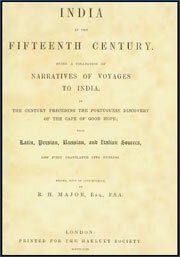 Narratives of voyages to India in the century preceding the Portuguese discovery of the cape of Good Hope from Latin, Persian and Italian sources. William Irvine, the son of a Scotch advocate, was born in Aberdeen on 5th July, 1840. Arriving in India on 12th December, 1863, he was attached to the North-Western Provinces Civil Service in the following June, as Assistant Magistrate of Saharanpur. 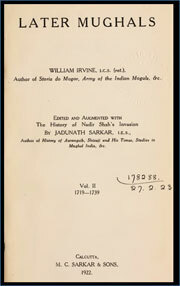 With such a wealth of original Persian sources in his possession and his knowledge of continental tongues opening to him the East Indian records of the Dutch, French and Portuguese Governments, as well as those of the Christian missions to the East (especially the letters of the Society of Jesus), Mr. Irvine planned an original history of the decline of the Mughal Empire. 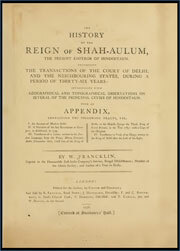 It was entitled The Later Mughals and intended to cover the century from the death of Aurangzib in 1707 to the capture of Delhi by the English in 1803. We know much about the private lives of the Mughal Emperors, the ceremony and splendor of their Courts, and the condition of the roads, from the writings of the many European visitors to our land. But their administrative system has not yet been subjected to a detailed study on the basis of the original Persian records. 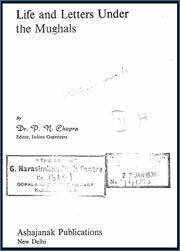 This is a task of admitted difficulty, partly because so many of the records have perished in the course of time, but mainly because it is only men experienced in the actual conduct of modern Indian administration who can go to MUGHAL ADMINISTRATION, the very heart of the Mughal system and make the dead past live again before our eyes. Abbas the Great came to the throne of Persia in 1586. He found his country in that condition of anarchy which in a despotic state is the invariable accompaniment of any weaken- ing of the central power. Under these circumstances, it required no great political instinct for the king to see the wisdom of keeping in friendly relations with Akbar, the Sunni emperor of India, especially as that emperor had brought India to a height of power and prestige never known before. Fortunately, it was not difficult. Akbar had already shown that he had no desire to add Persian provinces to his territory. Sir Henry Miers Elliot KCB  (1 March 1808 – 30 December 1853) was an English civil servant and historian who worked with the East India Company in India for 26 years. He is most known for The History of India, as Told by Its Own Historians based on his works, published posthumously in eight volumes, between 1867-1877 in London. Bāburnāma is the name given to the memoirs of Ẓahīr-ud-Dīn Muḥammad Bābur (1483–1530), founder of the Mughal Empire and a great-great-great-grandson of Timur.It is an autobiographical work, written in the Chagatai language, known to Babur as “”Turki”” (meaning Turkic), the spoken language of the Andijan-Timurids. 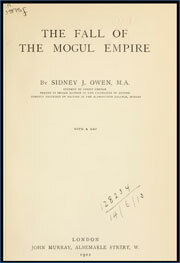 This book is not a regular history of the period over which it extends, but the substance of a course of lectures intended to trace the operation of the causes which, in the course of a century, reduced the mighty and far-famed Empire of the Great Mogul to a political shadow. 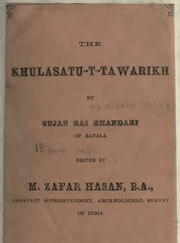 Khulasat-ut-Tawarikh is an Indian Persian language chronicle by Sujan Rai. It deals with the history of Hindustan, and also contains details about the contemporary Mughal Empire. 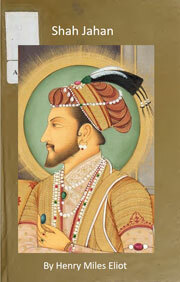 The author completed the work in 1695 CE, during the reign of Aurangzeb. An insertion about Aurangzeb’s death was later added to the original copy by a transcriber. 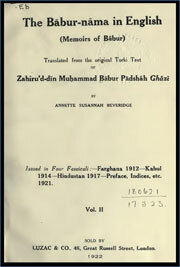 Tuzuk-e-Jahangiri or Tuzuk-i-Jahangiri is the autobiography of Mughal Emperor Nur-ud-din Muhammad Jahangir (1569-1627). Also referred to as Jahangirnama, Tuzk-e-Jahangiri is written in Persian, and follows the tradition of his great-grandfather, Babur (1487-1530), who had written the Baburnama; though Jahangir went a step further and besides the history of his reign, he includes details like his reflections on art, politics, and also information about his family. The history of the reign o[ Jahangir depends almost entirely on I he memoirs written by himself or under his directions. 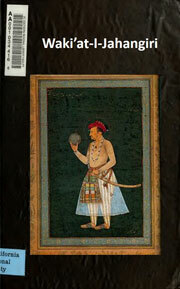 It has long been known that there were different works claiming to be autobiographies of Jahangir. 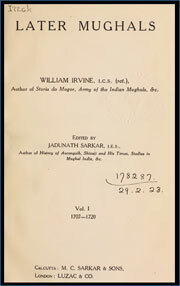 Wakiat-i-Jahangiri was an important attempt which Sir H. M. Elliot undertook with the help of some other famous writers. He gathered the selected information from the original memoirs (Tuzk-i-Jahangin) and compiled them in a very concise form giving the whole picture of the reign of Jahangir. 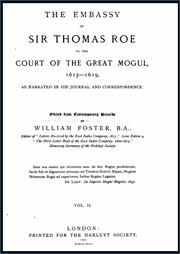 Sir Thomas Roe (c. 1581 – 6 November 1644) was an English diplomat of the Elizabethan and Jacobean periods. He sat in the House of Commons at various times between 1614 and 1644. Roe was an accomplished scholar and a patron of learning. 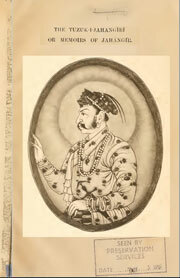 From 1615 to 1618, he was ambassador to the court at Agra, India, of the Great Mughal, Jahangir. 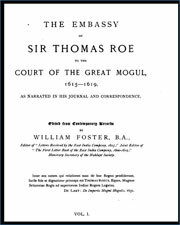 The principal object of the mission was to obtain protection for the East India Company`s factory at Surat. At the Mughal court, Roe allegedly became a favorite of Jahangir and may have been his drinking partner. This greatly enhanced Roe’s status with the Mughals. His journal was a valuable source of information for the reign of Jehangir. 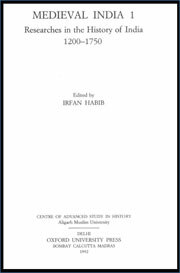 A biographical work on the life and contribution of Shaikh Bhina, a friend and personal physician of Jahangir who also served as the Governor of such provinces as Bihar, Delhi and Gujarat under Jahangir. He grew up under Akbar and retired under Shahjahan. He was also a well known veterinary expert of the Mughal period. 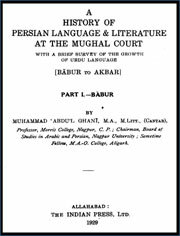 Some valuable works exist on the growth of Persian language and literature in Persia, but there was none available hitherto in a concise and connected form of any period in India. The present work, therefore, is an attempt to supply a long-felt need in that direction. 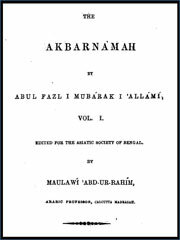 After the publication of Shibll’s “” Shi’r-ul-Ajam,”” there was a great move on foot in India to construct its literary history on similar lines under the title of “” Shr-ul-Hind”” so as to determine what part India played in the growth of Persian language and literature. I am glad to present to the reading public a comprehensive volume entitled Life and Letters under the Mughals. 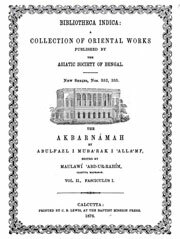 It includes my two earlier works Some Aspects of Society and Culture during the Mughal Age and Social Life under the Mughals, which have been thoroughly revised in the light of recent researches. The third volume Literature during the Mughal Age, which I intended to bring out separately, has now been included in this volume. I hope this volume will be useful not only to the scholars and litterateurs interested in the past but also to students of contemporary social affairs by indicating elements in our rich and composite heritage that have stood the test of time and deserve to be preserved. Dara Sikoh the eldest son and heir apparent of emperor Shah Jahan is a unique firure I the Mughal imperial family. He is chiefly remembered for his tragic end, but few people realise that the tragedy lay not so much in his death as in his life. 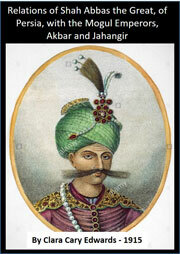 the Mughal princes who followed Akbar belonged to a set type. Valiant, debauched and luxurious they excelled in fighting and drinking often both. The imperial throne was their only objective in life. They divided their time between camp and harem and cared very little for intellectual pursuits. Into this world was born a mystic philospher, a devotee of knowledge adn seeker of spiritual truths. Had Dara been born into a regular house he would have lived nad died as a pious saint.